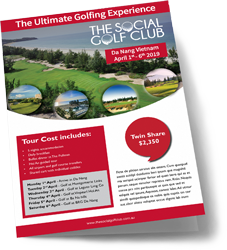 Join us on the ultimate golf experience to Vietnam in 2019. Vietnam is home to some of the best courses in Asia and the world, designed by some of the biggest names in golf. And lets not forget the great tasting great food, shopping and culture. Our tour is a fully guided experience with lots of fun, competitions, optional tours and of course – plenty of golf! Arrive in Danang – transfer to the Pullman Danang 5 Star Resort. Golf at Laguna Lang Co (Faldo). Golf at Vinpearl Hoi An (new IMG course opening this month) followed by Hoi An ancient town escorted tour. Golf at Ba Na Hills (Luke Donald) followed by a full buffet dinner. Golf at BRG Danang (Norman). Depart for Danang Airport. To reserve your place on this incredible international tour just download, fill out our Vietnam tour form. Even more simply, register your interest by filling out the form below and we will contact you to answer any questions.